Sari Alesh's promising music career was cut short by war. With the help of sponsors, the violinist can now play once more. Sari plays his violin in the Alix Goolden Performance Hall, part of the Victoria Conservatory of Music. Unlike most of the 31,000 Syrian refugees arriving to Canada over the last year, Sari Alesh, 31, did not bring a trade. Instead, among his few possessions, he brought his music. 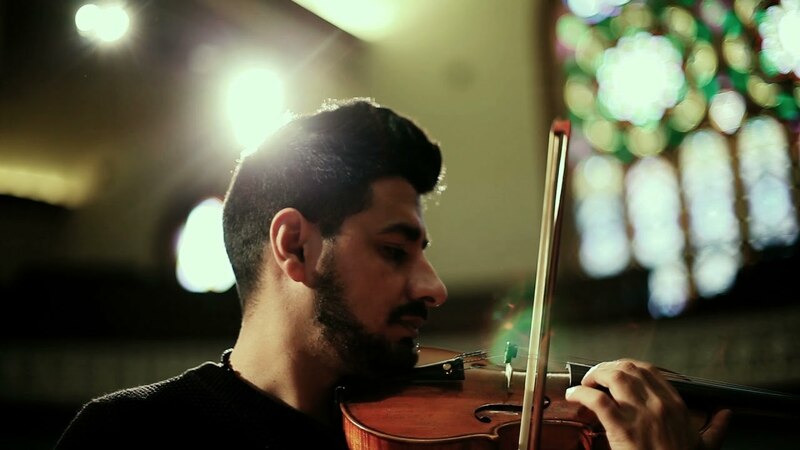 The young violinist arrived alone on the rainy archipelago of Canada’s west coast in February, 2016 – on his birthday – as one of the 400 Syrian refugees resettled to Victoria. Before his arrival, Sari’s life had overflowed with music. Classically trained in Damascus, Syria, he toured Europe and the Middle East with the Syrian National Symphony Orchestra, once playing for the acclaimed Lebanese singer Fairuz. But war in Syria quickly put the brakes on his success, displacing him along with more than 11 million other Syrians. In 2014, he fled the Syrian capital and sought safety in Istanbul, Turkey, leaving behind family and his once-promising musical career. Safe in Canada, one Syrian refugee is hearing music once more. Once in Victoria, Sari quickly discovered that the musical landscape of his new home was as bewildering as the towering red cedar trees of Vancouver Island. Expecting sonatas and arias of classical European pedigree, he instead found that fiddle music was most popular. Early on, he found artistic refuge with Faraidoun Akhavan and Paulina Eguiguren, two of his sponsors. With Sari on his violin and Faraidoun on his barbat, a Persian lute, the pair played Middle Eastern music late into the evenings. Like many people in Victoria, Faraidoun and Paulina had wanted to sponsor a Syrian family or individual, but were unsure of the process. Separately, they had each approached a multicultural organization in the city that acted as a sponsorship agreement holder – the umbrella group that handles private sponsorship in Canada. But as the prospective sponsors talked, having agreed to pool resources for a Syrian refugee, they found a common thread linking them together – they all had strong connections to the arts. “It was just too perfect,” says Sabine Lehr, the coordinator of the organization that matches refugees with sponsors. By chance, her daughter Julia also played an instrument. Paulina was not looking for an instructor at the time, despite Sari’s six years of teaching music students in Syria. To her surprise, an instant chemistry developed between the two of them when they first played together – a shared connection through the notes on the page. Soon, her home would fill with the sounds of Julia’s accordion complemented by Sari’s violin. Sari’s new, quieter, safer life in Victoria was the first sign that his life and career, slowly dismantled by conflict, might return. He soon received a scholarship to study English at the University of Victoria. It was an opportunity to further improve his language skills and immerse himself in the community, and he dreamed of earning a degree in education that would enable him to teach music in public schools. As the musician became a more visible presence at the school, others took note. Maestro Ajtony Csaba was one of them, offering Sari the chance to play with the University of Victoria Orchestra. He quickly became a sought-after player for benefit concerts and community events, and was invited to perform on the lawns of the Legislative Assembly of British Columbia for Canada Day. But war had taken its toll in more ways than one – Sari's previously quick movement of fingers had slowed through lack of rigorous training in his years on the run. One of his sponsors, Heather Ferguson, sat on the board of the Victoria Conservatory of Music. With stepchildren the same age as Sari, she felt determined to help him. “If ever their lives were torn apart and they were in need, I would hope that someone, somewhere in the world, would give them a helping hand,” she says. She arranged for one of Canada’s top strings teachers, Michael van der Sloot, to mentor Sari and rebuild the skills that had atrophied over the years of fleeing war. Cloistered in a small office in the conservatory, Sari dove into the music with his teacher. Notes became a thread back to his life in Syria. The melodies were different, but the actions felt comforting.